Money matters? Perspectives on Monetary Policy: Where could ECB interest rates go? Economics is mostly quantitative, being dominated by mathematics in its theoretical framework and by econometrics in its empirical one. Central banking seems instead to be dominated by a literary approach. In July 2012 the “Whatever” utterances by Draghi contributed to change the path of the € crisis. In the last press conference, his statement about the Governing Council being “comfortable” in acting at the subsequent policy meeting sent a clear message that the ECB convinced itself, not too early in the view of about everybody else, that something had to be done to counter the gradual dis-anchoring of inflationary expectations . Since Draghi´s statement, the question has been what precisely could the ECB do. It seems now clear that it would come out with a package of measures, but the content of this package is unknown as yet and one can imagine that the best minds in Kaiserstrasse are applying themselves to this issue, which will only probably be settled in the actual meeting on June 5th. In this post I examine what could be the consequences of one or the other content of the package. In order to do this I will first recall some basics of ECB interest rates, then I would introduce some subtler qualifications, I will then explore two of the main possible scenarios. Finally, I will give my expectations about the content of the package. The overnight rate, EONIA, is bracketed by the interest rate floor (deposit rate), now at 0%, and the ceiling rate (normally this was the Marginal Lending Facility rate but, given the fixed rate full allotment procedure, this is now the Main Refinancing Operations - MRO - rate), now at 25 bp. The actual position of EONIA within the corridor is determined by excess liquidity, as shown in Chart 1 below. Since liquidity is demanded by banks, actual EONIA development are not fully controlled by the ECB: heavy demand of liquidity by banks will bring EONIA close to the floor, low demand will take it close to the ceiling. In the chart, one also sees that as excess liquidity gets smaller than, say, 200 billion, the relationship between EONIA and excess liquidity gets very noisy. I will recall below that there is indeed a systematic component behind current EONIA volatility. 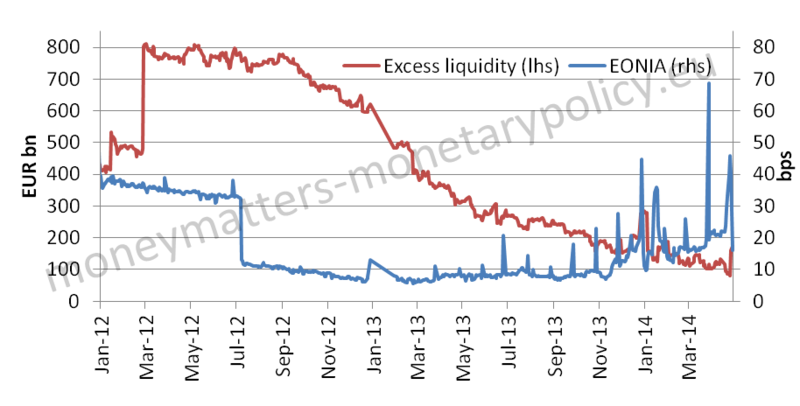 The spread between EONIA and the MRO rate (normally negative), in turn depending on excess liquidity. The development of 3 months OIS indeed shows that lower average excess liquidity recently increased EONIA expectations and thus OIS, in particular from around 10 basis points in September 2013 to nearly 20 now, while expectations about MRO were clearly stable (see Chart 2). EURIBOR is determined by OIS for the relevant maturity plus a spread. The spread is now around 15 bp and has been at around this level since the autumn of 2012 (see Chart 3), but in the acute phases of the crisis it was much higher depending on credit and liquidity risk. Credit risk applies because EURIBOR is an unsecured rate while in the OIS there is no exchange of capital. Liquidity risk applies because if a bank fears there will be liquidity problems in the future it will not give it away in a cash contract today. Arbitrage should bring short term German paper rates (Bubill/Schatz) close to the rate on the same maturity OIS, since in both there is very little credit and liquidity risk, but there is some variability in the spread between the two rates and the rate on bubills is somewhat lower on average than the OIS (see chart 4). 5. An important part of the ECB package will be the accompanying words. As regards point 1, the special relationship between Landesbanken and Sparkassen in Germany should be recalled. The two groups of banks have some captive business among themselves, which leads to Sparkassen borrowing more expensively from Landesbanken than market prices would indicate. Given the weight of these transactions in the EONIA panel, EONIA is biased up by some 6-9 basis points. Indeed EONIA remained at this level even when excess liquidity was at its peak (see Chart 5). Thus Eonia is further constrained than considerations of the sheer MRO-Deposit rate corridor would imply. In current conditions, for instance, the effective corridor is something like 7 to 25 basis points, instead of 0 to 25. As regards points 2 and 3, the following considerations apply. As mentioned above, liquidity is not decided by the ECB but by the aggregate behaviour of banks, given the full allotment fixed rate tender procedure and the freedom banks have to return every week the money they borrowed under the 2 three years LTRO, as well as their decision about participating or not to the operations to sterilise Security Market Purchases (SMP). Of course, if the ECB would stop the sterilisation of SMP, it would force some 170 billion of liquidity into the system and bring excess liquidity into the region in which EONIA is more stable and closer to the floor (See again Charts 1 and 5). However, if banks do not want to hold the additional liquidity, they will draw less under the existing facilities, return more money under the 2 three years LTRO and participate fully in SMP sterilization operations, so that the effect of additional liquidity will fade over time. Over a 3 months period the effect could have completely dissipated. In the same direction would work the reduction of the deposit facility rate (and of the remuneration on current accounts) into negative territory: if the banking system would have to pay the ECB to deposit the liquidity it drew from it at a cost, it would reduce its demand of liquidity and therefore, again, quite quickly bring EONIA towards the corridor ceiling. This should have an anticipated upward effect on OIS and therefore EURIBOR. The development would be different if the ECB gave more incentive to banks to hold liquidity. For instance, if it conceded another Very Long Term Refinancing Operation - VLTRO - (not necessarily again for 3 years) at fixed rate, after having reduced the MRO, or with a cap, instead of a floating rate like now, banks would demand more liquidity and hold it for longer, so EONIA would remain more persistently close to the bottom of the corridor and thus also OIS and Euribor would be lower. The probability of a new VLTRO is not low (see below), especially in view of the maturity of the existing ones at the turn of the year. As regards point 4, as long as there is a symmetric reduction of the MRO and of the deposit facility rate and thus the corridor remains at its present width and as long as excess liquidity demanded by banks does not grow again beyond 200 billion, there will be volatility in EONIA, as apparent over the last 6 months (Chart 4). Indeed there is an intrinsic instability mechanism at work. The mechanism I have explained in my cobweb post  is the following: when market rates are close to the ceiling of the corridor there is an incentive for banks to borrow from the ECB rather than from the market. But by borrowing they increase liquidity and bring rates towards the bottom of the corridor, and thus make borrowing from the ECB less convenient. This reduces liquidity and brings rates up again, in a yo-yo behaviour. Looking at it across banks, if a bank expects the aggregate banking system to borrow a lot from the ECB it is better for that bank not to borrow and expect to borrow more cheaply from the market, and vice versa. But, of course, there is no equilibrium in this situation and therefore EONIA is unstable. Instability, however, can be confined to very short maturities and thus not affect OIS and EURIBOR beyond, say, one month. As regards point 5, market expectations after the move will depend on the accompanying words. If Draghi will give an indication that the Council will not consider further moves, then there could be less of a reduction of rates and, possibly, an appreciation of the exchange rate. If, instead, he would say that the Council has given a first instalment of measures and will be ready to do more if needed, especially when it comes to bringing inflationary expectations more quickly towards 2.0%, this could give more weight to the easing package. Let me explore now how the basics and the qualifications would work under two scenarios on the corridor, the second one with two variants about liquidity. If the MRO rate was brought down to, say, 10 basis points but the deposit rate was left unchanged at 0, EONIA should be constrained in principle between 0 and 10 basis points. However, given the Sparkassen-Landesbanken relationship mentioned above, the range of EONIA would be further limited, say between 7 and 10 basis points. The influence of excess liquidity on EONIA under this scenario is muted, since the latter can only move within the restricted corridor. In these conditions, it does not particularly matter what is the value of excess liquidity and thus whether the ECB maintains the sterilization of the SMP or not or whether it provides another VLTRO. OIS would remain close to the value of EONIA for the foreseeable future. EURIBOR could maintain its 15-20 basis points spread to OIS. The Bubill rate would tend to move down with OIS and probably settle in negative territory, but with some volatile spread. The current level of 3 months OIS at some 13 basis points and of EURIBOR at 32 bp are a bit too high to incorporate a full probability of a cut of the MRO rate to 10 basis points and the maintenance at 0 of the deposit rate. · Cut of both MRO and deposit rate by 15 bp. The new corridor would be -15 to + 10 bp and EONIA would have the same latitude of move as currently, say between – 8 (given the Sparkassen-Landesbanken story) and +10. The position within this corridor would depend on excess liquidity and, given the wider range, this would be more important. As mentioned above, the negative deposit rate would exert a negative influence on the demand of liquidity by the banking system as the latter would try and minimise drawing from the ECB just to deposit the liquidity back with it and be penalized by a 15 bp negative rate. So, absent any liquidity action by the ECB, EONIA would gravitate towards the ceiling of the corridor and the cobweb phenomenon would again be there. OIS would tend to stay close to average EONIA and Euribor could be around 20 basis points above OIS, at 22 basis points or so. The Bubill would be just slightly negative. If the ECB stopped SMP sterilization, as mentioned above, this would on impact increase excess liquidity by some 170 billion and this would, initially, push EONIA down within the corridor, say towards – 8 basis points, also taking into account some resistance towards too negative rates. However banks would likely accelerate their reimbursement of the money borrowed under the two 3 years LTRO and further reduce their borrowing under the existing facilities, thus quickly reducing excess liquidity and making the effect of the non-sterilization quickly dissipate. Over a period of 3 months or less this effect could have disappeared. So while at the beginning EONIA would tend to be negative, it should then move up to gravitate around 10 basis points or slightly lower, close to the MRO ceiling. OIS should not be too affected by the initial fall of EONIA and probably remain from the start above 0 and up to 10 basis point while EURIBOR could maintain unchanged its spread to OIS. The Bubill rate would again follow OIS, albeit with some volatile spread, but would most probably be negative. If the ECB would grant another VLTRO with favourable features, like a fixed, very low, rate or an interest rate cap, banks would demand more liquidity and would keep abundant excess liquidity in the system for longer, thus the initial downward effect on rates would be more persistent. Let me summarize the different scenario in the following table, with the proviso that the indicated values must be understood as approximations to actual values, even when they are indicated as point values rather than ranges. So, most easing would come, among the scenarios considered in Table 1, from combining a lower MRO, a negative deposit rate and a new Very Long Term Refinancing Operation. This scenario is not consistent with the current configuration of rates, indeed current money market rates do not even fully imply, as mentioned, the blandest easing considered in the table. 4. New Very Long Term Refinancing Operation, 50%. I have not said much about QE as I regards it as unlikely. Nor have I dwelled into the liquidity consequences of an ABS action, as I regard them as minor for the foreseeable future. Finally, I have not even mentioned a prolongation of the fixed rate - full allotment procedure, as this is not likely to have any effect on rates in the short run. As regards the accompanying words, I think the package will be presented as a first instalment, which could be followed by other measures if needed, even if one cannot exclude that the hawks would ask for words excluding further easing as the price to agree on a package. A cobweb in the Eurotower.